Century Water Conditioning & Purification, Inc. is Southern New Jersey’s most trusted name in Water Treatment Systems and Solutions since 1986. Let the experts at Century Water provide you with the perfect solution that will improve the drinking water in your home. We can determine what issues are affecting your home's water & provide you with the best solution to correct it. Remove deadly chemicals & contaminants in your home or business's water that could lead to serious health issues. Our expert staff and technicians take great pride in providing professional water conditioning services to homeowners and businesses alike in Monroe Township and surrounding areas in Southern New Jersey! Whether you have city water or well water, Century Water Conditioning & Purification, Inc. can perform a basic water test and analysis in order to provide you with the best water treatment solutions to keep your water at healthy levels and safe from harm. Water is a basic necessity of life! Without it, life as we know it would cease to exist, so having clean & safe drinking water for your family or the employees of your business is very important. Just because your water may look clear or doesn’t have a strong odor, it doesn’t mean that it is free from particulates or chemicals that could be harmful to your health. If you are unsure about the quality of your water, contact us today and we will come out and perform a basic water test and analysis then discuss your options for water treatment. Lead Contamination: Am I at Risk? Chlorinated Water: Should I be worried? Dangerous levels of Chromium 6 has been found in the tap water of over 200 million homes & businesses in the United States. It has been determined that contaminated tap water is found in and around rural areas close to cities, so if you live near a city, your water is most likely contaminated. The EPA has estimated that over 10 million homes across the US are served with lead service lines, which weren’t banned until 1986. Additionally, if you have cooper or metal water supply lines, you could be at high risk for lead poisoning and should have a water test done immediately. Chlorine is used to disinfect the water and it is in virtually 100% of US water supplies, but chlorine is not that healthy for you. Research has shown that a byproduct of chlorine that is found in drinking water, Dichlorophenol, is a contributing factor to developing food allergies. But thankfully you can effectively filter chlorine & chloramines with a good filtration system. I'm a ten year customer and I had my one year water conditioner tank service done. You had sent me one of your technicians to do the work. I feel he did a great job for your company. He answered questions about my service that I needed to know due to the fact that I am disabled. I wish all servicemen who come to my house were like him! I would just like to take a minute to thank you for the great job that was done at my Franklinville home. Your technician was a true professional and did an outstanding job and treated my home like his home, took the time to do the job right and fully explain everything to me. I also wanted to point out that I was referred to you by my daughter and I will also refer you without hesitation, as if you do the job right the word continued to spread. As promised, I am writing to let you know that I was very pleased with the service provided by one of your professional technicians. We are the new owners of the property, the previous owner used your company so we thought we would give you a try. Needless to say, we were very satisfied. The technician patiently explained the system and answered all our questions professionally and friendly. He was very helpful. Because of your professional & helpful technician, we will continue to use your company in the future. Last week your company installed a POET system in our home. It was an extensive job which required skill in maneuvering much equipment in a small space. Matt and Max were informative, professional, courteous, knowledgeable of their work, and clean! It is said that word of mouth is the best advertisement and I will be spreading the word. Thank you for a job well done. We are not a “one size fits all” company which is why we provide a number of different solutions for homeowners and businesses to improve the quality of their water. Contact us today to have us come out and do a complete analysis of your water to determine what the best option is for you. 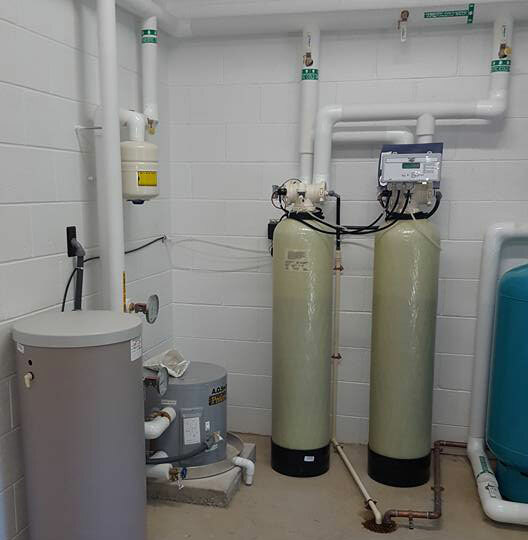 Whether you are a homeowner or a commercial business, we can provide you with the best water treatment solutions. We only use the best products in order to ensure your water is 100% safe and free from pollutants & harmful chemicals. Having a test & analysis done on your water will help us to determine what type of system to put in place to treat your water. These systems are compact and can be installed under any sink in your home for a simple solution for water purification. A whole-house filtration system can remove contaminants from your water making it potable for every day use. Point of Entry Systems act as a "pre-filter" to all of your individual supply lines that feed into your home or business. Contact us now and we’ll be happy to come out to your home or business to discuss water treatment solutions that are best for you!